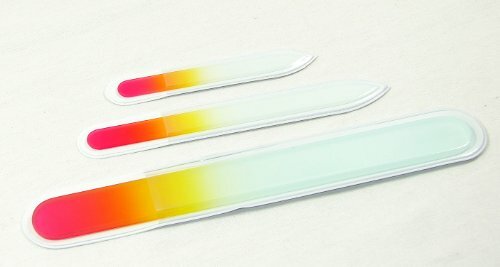 Set of three crystal nail files by Mont Bleu- great for purse or travel! Protective sheath included for each nail file. Guaranteed to never wear out or wear down., Use on natural or artificial nails – manicurist do! Continued use reduces chipping, peeling and splitting of natural nails. Won’t tear or harm delicate skin – safe for diabetics and babies. Filing surface is non-porous, double-sided and permanently etched into the glass. Board certified in every state for manicurists. Made from float glass, the same process used to produce wine goblets and crystal vases. Environmentally friendly – NO LEAD is added or chemicals used during the manufacturing process. Tempered and hardened for durability and safety, 102% stronger than standard glass. Grit on this small file is approximately 200 – 220 grit (that’s good if you are not a manicurist!). Clear & white plastic sheath is included with each file.